In the new odd tradition of pairing days of the week with colours (e.g. Black Friday), the last MNFC happened to fall on Blue Monday. This was something I was unaware of at the time, and as much as it concerns me that the phrase “the most depressing day of the year” does very little to help change the stigma of actual depression, it did have the effect of inspiring Helen to chose a film which is perhaps our most unlikely yet. The Lego Movie was chosen to help cheer us all up, and in the 100 minutes of chaos and laughter that followed, I am sure it was mission accomplished! In all it’s bright colours, rapid edits and fast paced action scenes, watching The Lego Movie was at times like having sherbet dibdab thrown at your eyeballs followed by a soaking in full-fat Coca Cola. At 15 mins in, an over-whelmed Comrade Lucy remarked “does it keep up this pace all the way through?”. It was the closest experience I’ve had to being 5 years old and high on sugar and caffeine, since I was 5 years old and high on sugar and caffeine. I also have suspicions that Helen may have laced the Indian takeaway with LSD… the toxicology report will be back soon and I will update the Tuesday Review accordingly. My collapse into a bout of man-flu in the days that followed may be due to a post-hallucination come-down, although I am not sure The Lego Movie can be entirely to blame for being stuck in bed for a few days feeling sorry for myself. It can, however, be blamed for aching ribs and cheeks, as it was a very funny film and full of great one liners. I suspect I only clocked about 5% of the visual gags too, as the screen is laced in detail, much of which flies past at speed or covered in explosions. As such, I feel it is well worth a re-watch… although I’m still getting my breath back from the first sitting! Whilst fully satisfying the demands and attention span of it’s intended younger audience, the film is also laced with adult humour and subtext. In particular there is commentary on consumerism, on mass production, on loss of creativity, the family unit… proving that MNFC can chin-stroke at even the most unlikely of films. That said, I am not sure that Helen will be the strongest contender for “most pretentious film” in this year’s FAFTAs! And sadly, the producers of The Lego Movie were denied an Oscar nomination, to which the directors responded perfectly here on Twitter. The release of the film also created political waves, when Lego were found to be in partnership with the oil company Shell. 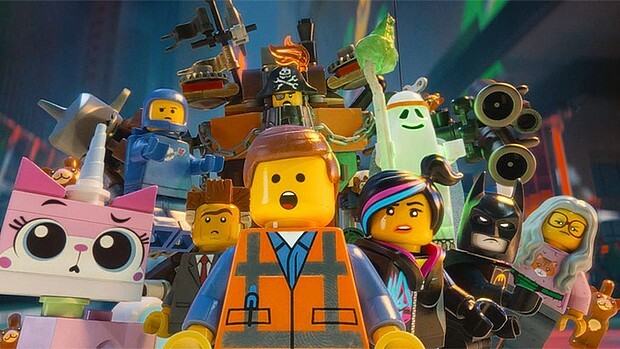 The short film that parodies the Lego Movie and criticises the company can be seen here. The online activism that followed was reportedly responsible for the end of this relationship, and Lego subsequently having to work hard to re-establish it’s green credentials. Given that the company makes plastic bricks, you can imagine that this was indeed quite a task. And was it successful? News reports such as this one highlight the effect on the environment plastic manufacturing can have. But what is interesting, in this instance Lego seems to come out of it with whimsy rather than public outrage. It almost seems light-hearted that the objects being found on a beach in Cornwall are nautical-themed, and have created a subculture of beach combers and enthusiasts. I am not sure that a sunken container of plastic bottle tops would be seen so lightheartedly. Still, why so serious? As I learnt on Monday night, everything is awesome. Everything is cool when you’re part of a team. As demonstrated by these amazing feats of Lego building, showing just how much time on their hands creativity people have. And, if anyone is in London until the 12th April 2015, it might be worth checking out this exhibition. So, looking forward to February, and our 4th Birthday party. Here’s to the many amazing films MNFC has yet to come. And if you wondered how 2015’s predicted biggest release movie would look in Lego, click here. Today will not be known as Review Tuesday. It will be known as Freedom Friday. But still on a Tuesday.